If you've never had the pleasure of reading a western, this book is the place to start. I learned my appreciation for westerns from my dad, who has a particular penchant for The Duke (John Wayne, of course). I spent a fair amount of my growing-up years watching classic western films and buying my dad secondhand copies of Louis L'Amour and Zane Grey novels for holiday gifts. There's something romantic and appealing about the deeply principled lawman, hunting down an unequivocally evil ne'er-do-well. Life in westerns is refreshingly uncomplicated, the line between good and evil clearly marked. This book, though published this year, reads much like one of the classic tales of my youth, but deeper, and with the added benefit of a female voice. Chapters alternate between the points of view of Lucinda, a woman recently escaped from a Texas brothel, and Nate, a newly-christened Texas State policeman. At first their parallel stories seem disconnected, but they eventually intersect in the most profound and surprising of ways. Nate teams up with Deerling, a hardened, gruff older lawman, and Dr. Tom, a cheerful and witty younger cop, and they mount their horses on the hunt for a man named McGill, suspected of murdering women and children throughout Texas. At first, Nate finds some of Deerling's methods suspect, even reprehensible, and refuses to follow some of his more extreme orders. However, as time goes on, Dr. Tom reveals more of their story, and the reasons they are chasing so hard to catch McGill become clear. Kent has written a fabulous villain in McGill—the man is utterly ruthless. She is also shockingly unsentimental about her characters' lives (think George R. R. Martin), which tightens the tension like a drawn bowstring. The danger surrounding Nate is palpable. 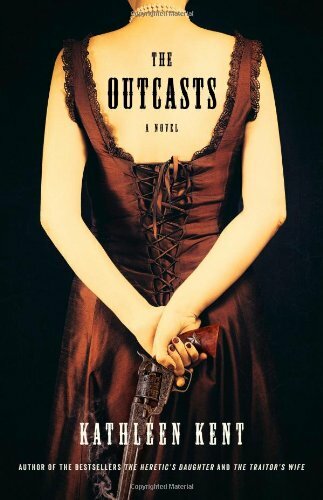 Another element setting this book apart from traditional westerns is the voice of Lucinda. She is a multi-layered, complex character who manages to inspire both pity and revulsion. Her life has been plagued by epileptic fits, which during the 1800s were not understood and often thought to be catching. Her father committed her to various insane asylums due to her condition. However, because of her hard life, she has become a powerful manipulator and bends people to her will with a smile or crook of a finger. She definitely does not fit the tired damsel-in-distress archetype that poisons many older westerns. Bottom line: Read this book. Yeehaw.